To run the forums, host the website, and travel, I charge a universal service fee for my reviews. 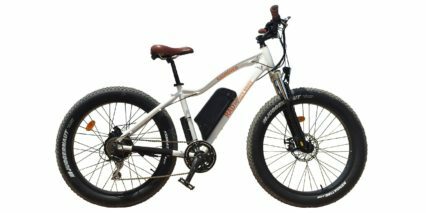 This in-depth review was sponsored by Rad Power Bikes. My goal is to be transparent and unbiased, this video and written review are not meant to be an endorsement of RAD products. 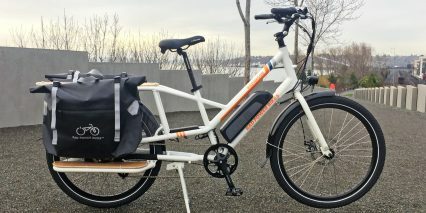 Spending time with Rad Power Bikes in Seattle gave me another excellent opportunity to take a look at the updated 2019 RadWagon electric cargo bike. Being around a bike like this just really gets the ideas pumping and you get excited to see that potential prove itself. To start off, two color variants let you chose between orange or white each with cool new badges and graphics. Both are a great pick for high visibility, letting drivers and others spot you and your cargo. 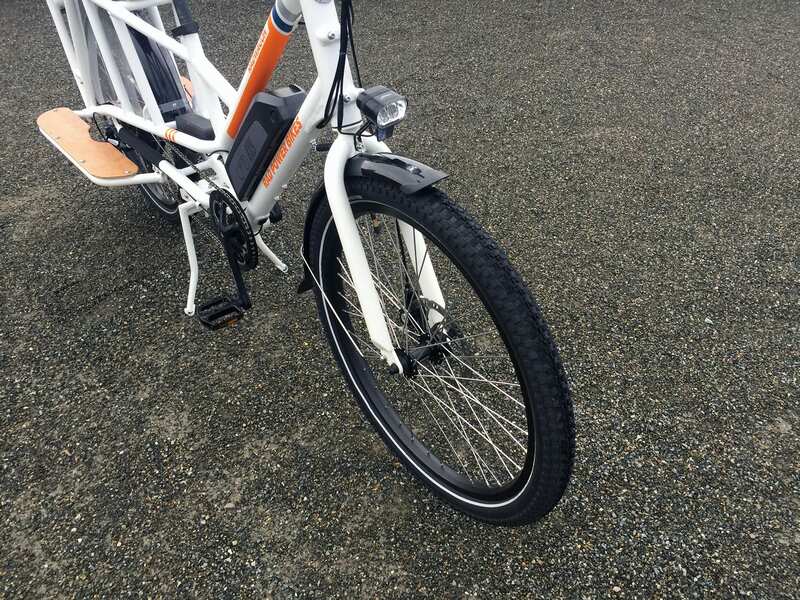 Loading is easier since the bike features a deflopilator which keeps the front wheel alined and balanced when parked. 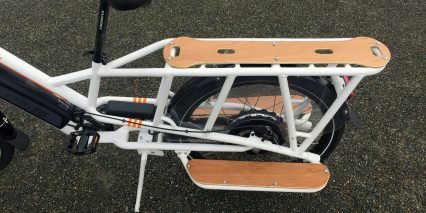 Also adding support is the double leg center mounted kickstand which is rated in itself for 100 lbs. 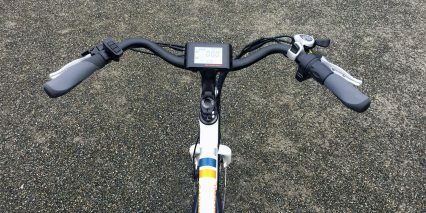 Although the bike only comes in one frame size, there are many adjustments that can be made to suit the user. 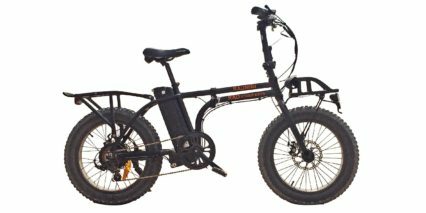 The standover hight is 26″ which should accommodate many riders. An extra large seat post clamp makes on-the-fly seat adjustments easy to do. 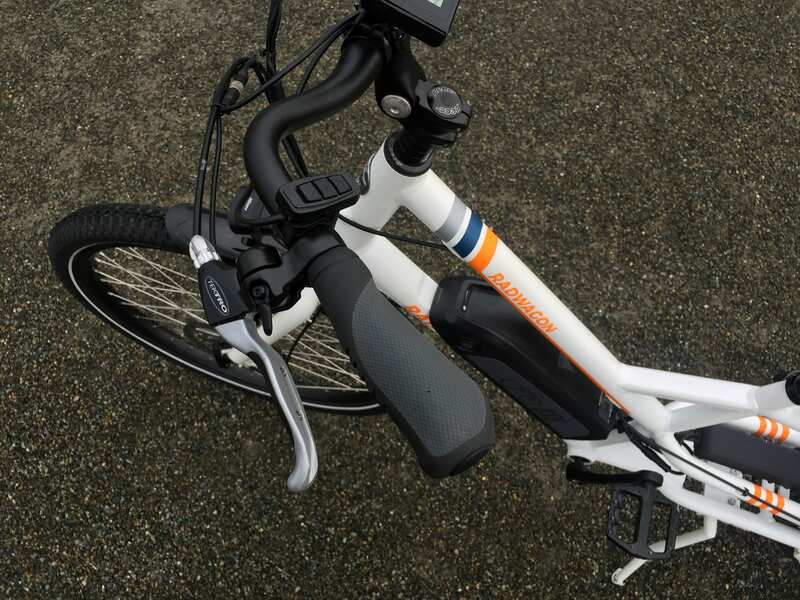 Also there is an adjustable sweeping handlebar stem. 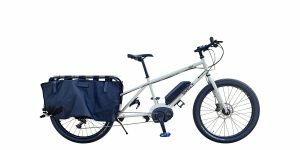 Both of these are great if you have varying kinds of cargo, as you may need to make adjustments frequently. 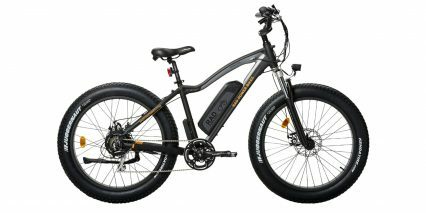 Although there is no suspension, there are a lot of features to make the ride more enjoyable. 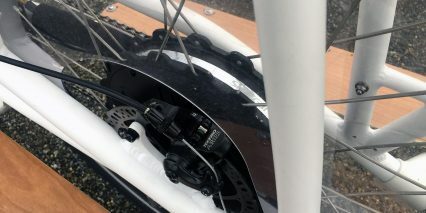 The longer wheelbase will give added comfort and the sturdy steel fork will apply some vibration dampening. The seat post is 27.2mm so you can add your own or get Rad Power Bikes suspension seat post to increase comfort. 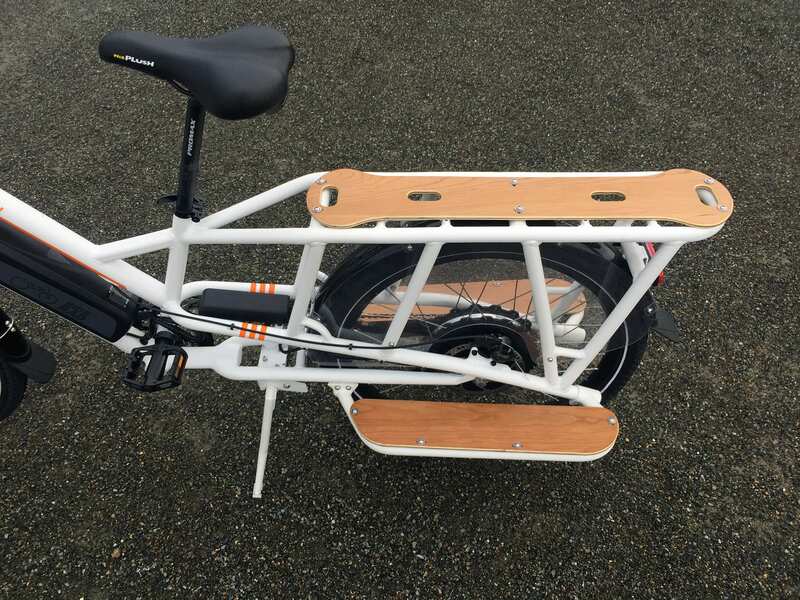 On the rear rack, wooden deck pads are included as well as a clear plastic skirt guard which will keep your pants protected. The RadWagon comes with fenders and rubber mud flaps. The rubber here really helps alleviate possible toe clipping which I really like. 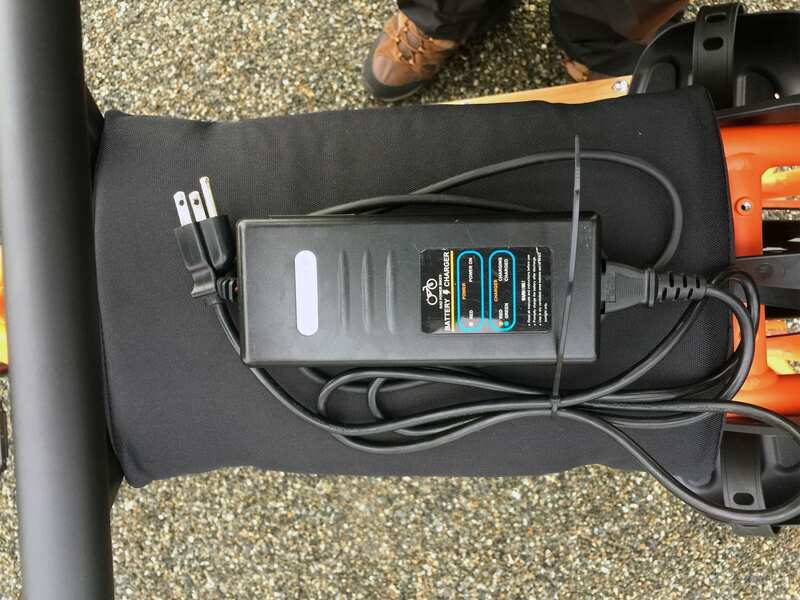 Battery weight is positioned forward to make up for a normally rear heavy bike. The bike has two tubes, extra gusseting just making it a really approachable misstep frame; very easy to load. 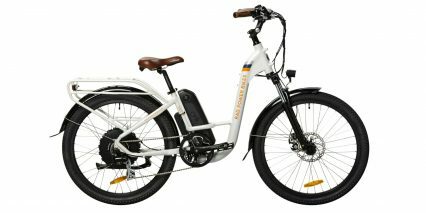 Two frame mounted battery integrated lights; one for the front and one for the rear which can act as an active brake light which gets brighter as you hold the brakes, or as a flashing rear light. 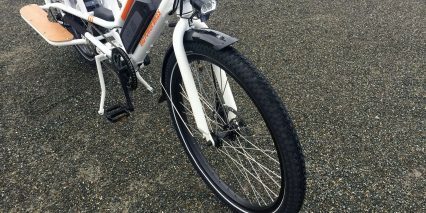 Special Kenda tires with reflective sidewall and K-Shield puncture protection are also standard. Another great upgrade is the conical disc brake caliper washers help prevent brake squeaking. A good upgrade to the bike is the nickel plated DNP freewheel which not only shifts smoothly, but will hold up better over time Other features include a quick release wheel, pro-wheel crank arm, aluminum alloy Wellgo extra wide platform pedals, a chain guard built around the chain ring, and a neoprene slap guard to protect the frame from the longer chain. 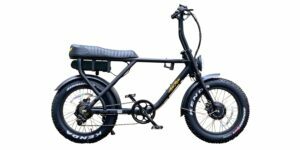 Overall, the bike weighs 73 lbs but that double digit weight is rated at triple digit strength; the bike is rated to withstand 350 lbs. 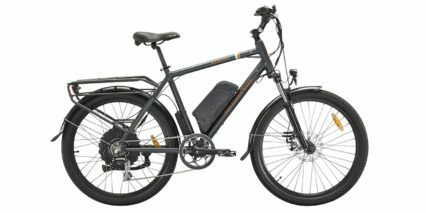 Driving the Rad Wagon is a 750 watt (or 500 watt if you’re in Canada) gearless, direct drive, hub motor. Made by Shengyi, this thing is larger and heavier than a geared equivalent, but it’s smooth and extremely durable. 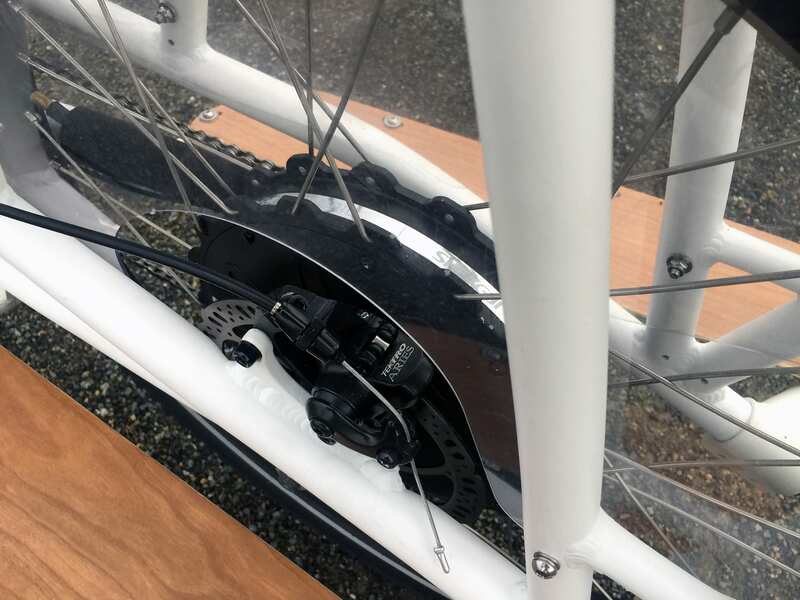 Gearless motors have to be wider in order to gain a mechanical advantage and they weigh more (15 lbs vs. ~13 lbs for the geared motors on the RadMini and RadRover) because they have more magnets and more copper winding to produce power. Coasting with this motor is slightly less efficient than many geared motors or mid-drives due to magnetic drag. 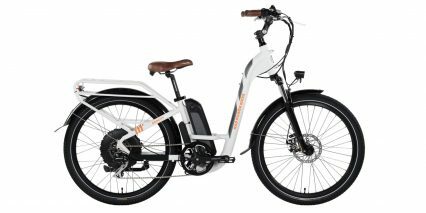 There isn’t a freewheel here, but that means you can actually recapture a bit of energy when braking, and Rad Power Bikes has designed both brake levers with inhibitor switches to activate regen every time you pull. It’s not the most efficient system, estimates of 5% to 10% recoup are what I hear, but it does reduce wear on the brake pads and help to make up for the heavier motor weight. 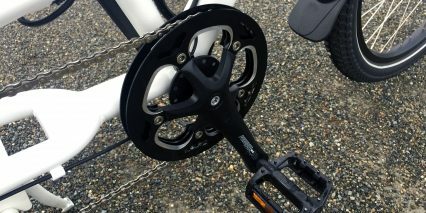 I noticed that the RadWagon uses a stainless Steel torque arm washer on the left rear dropout to provide extra strength. This is especially important with a heavier, higher powered, regen capable motor because it will “rock” and push one direction for power and then the opposite direction for regen. 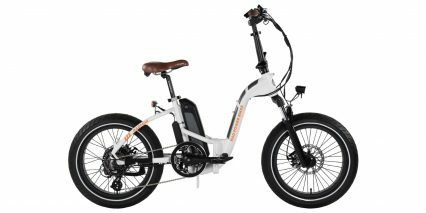 One of the unique features of this ebike, and all of the Rad Power Bikes actually, is that they offer pedal assistance as well as throttle operation. And, the throttle delivers full power from assist level 0 all the way through 5 so you can override assist. This is nice for starting out or getting instant help climbing. 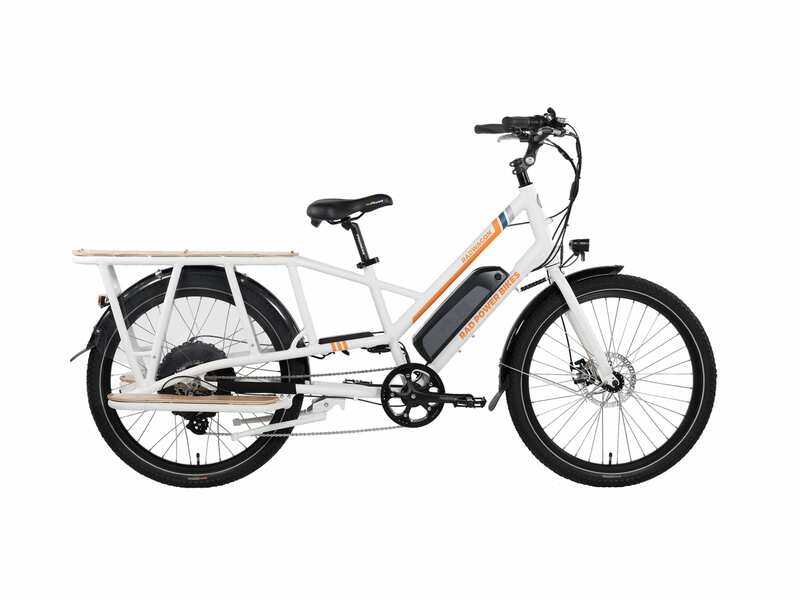 As shown in the video, this bike performs best once you have a bit of speed, starting from rest is a bit slow and less torquey feeling which could mean extra balance and pedal power when the bike is fully loaded. Again, you have 7 gears at your disposal and shifting will not be impacted by the completely separate motor systems, but you might need to plan ahead and shift down before stops to really be effective. 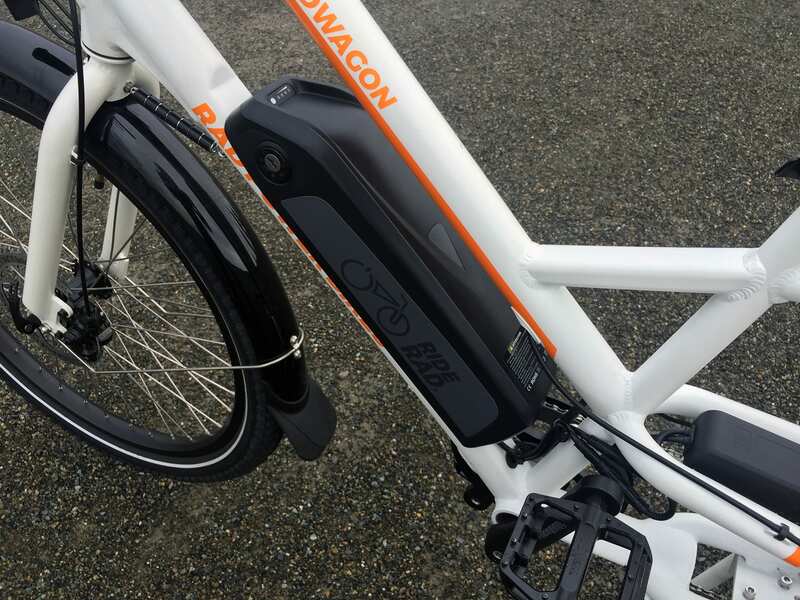 Operating the RadWagon is very easy, once the battery is charged, mounted, and locked in with the ignition towards on. You do not have to leave the keys in while riding and really should not attempt to do this for they could get snagged and bent. Up at the control pad, just hold the center “Mode” button and the display will blink on. 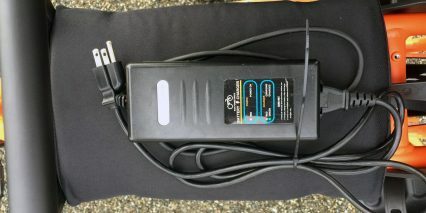 Rad Power Bikes is using a branded King Meter SWLCD that has been refined a bit from before. It’s the same grayscale, backlit, fairly large screen, but it now tilts up and down slightly and has an integrated USB Type A port, full sized for use with portable electronics. Being able to angle the display means you can switch riders who might be different heights, and still have a great view or reduced glare without needing any tools. Having the display in the center, separate from the rubberized control pad, makes it natural to view but still easy to interact with. The up and down buttons on the control pad allow you to navigate from zero to five level of assist which increases power and speed up to 20 mph. 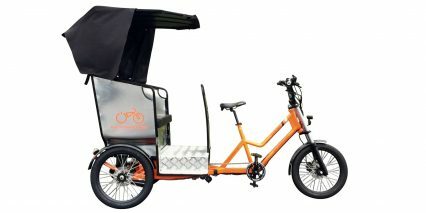 However, with the display, button pad, brake lines and motor inhibitors, throttle on/off button, and two sets of thumb shifters, the RadWagon has the most crowded cockpit and the most wires of any of their models (aside from the RadBurro commercial ebike). 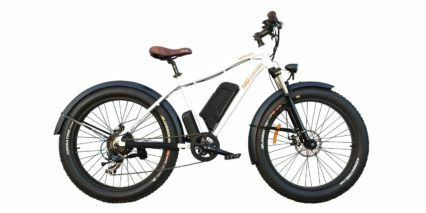 I am glad for all of these features, and I feel that RPB has done a good job managing the wires, but this e-bike isn’t quite as stealthy as some of the alternatives. The bike powers on at assist level 1 and the throttle is hot, so be careful when mounting and dismounting. I usually try to turn the bike off once I am seated and then off when I stop. One extra nice feature that is included, to help you manage how riding is done and to make the bike safer, is a throttle cutoff switch. 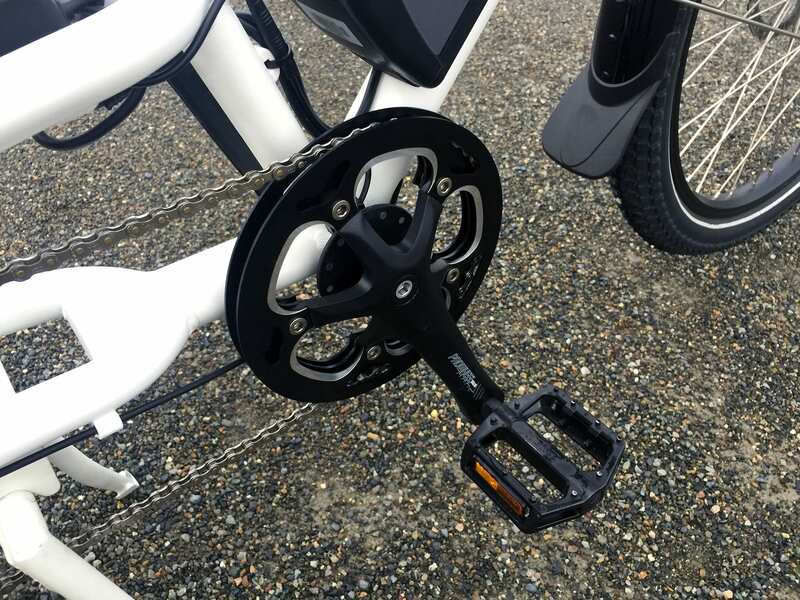 It’s located near the right grip and can be pressed in to kill the throttle, which might be nice if you feel uncomfortable with it or are maneuvering the bike. 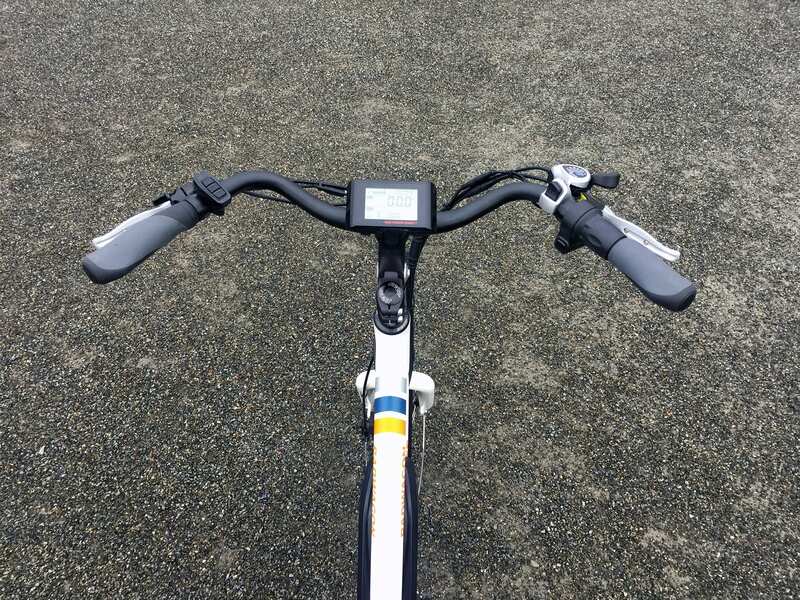 Note that Rad Power Bikes has upgraded to more responsive 12-magnet cadence sensors vs. the older 6-magnet design, and that you don’t actually need to push hard to get pedal assist working, just move the cranks steadily. 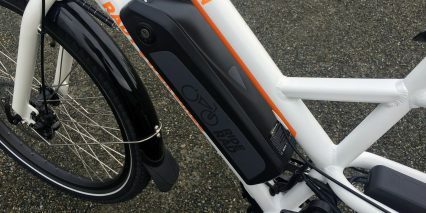 The benefit is that you can relax and stretch with pedal assist but the trade-off is that it’s more of an on/off response and won’t activate until the bike gets moving a bit first and you can actually turn the cranks. 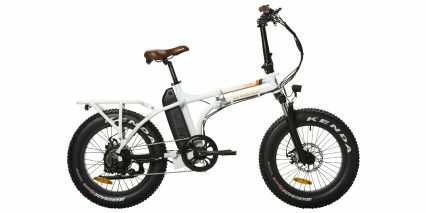 Compared to the new multi-sensor designs from Bosch, Yamaha, Shimano, Brose and other high-end centerdrive bikes it feels less natural and takes more time, but none of those products offer a throttle. Before wrapping up, I would also like to mention the many accessories available which really create a lot of cargo possibilities and options. In the rear, bike can fit 2 Yepp! 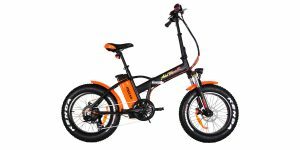 Maxi seats, has a deck pad option, and a finger protective handlebar accessory for children. 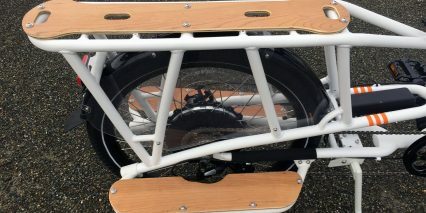 It also has room for heavy duty reflective pannier bags and has plenty of mounting points and reinforced bars for bungie loops. 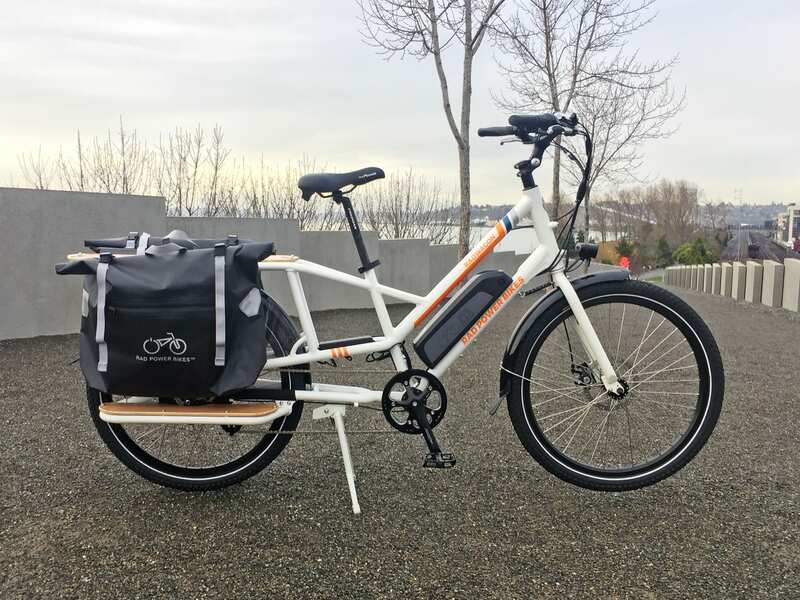 This is just a sample of some of the uses that come to mind, of course, there are many others as the rest of the bike has opportunities for configuration as well. 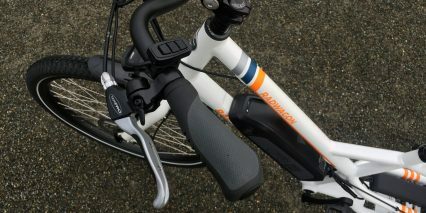 The down tube features bottle cage bosses that could also be used for a folding lock, mini pump, or anything else you might need to take you that extra mile. On the head tube, you have a section for a frame mounted front rack. 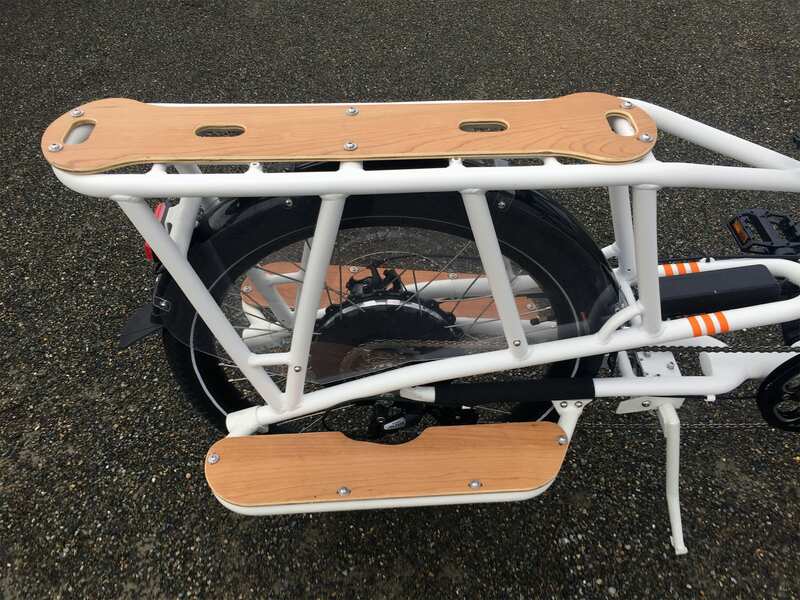 The included front light can then be remounted to the front rack and still keep full functionality. 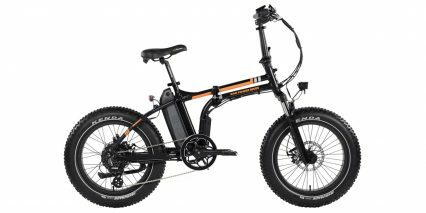 All in all, a competitive price point of $1,599 before accessories and a 1 year warranty with free tech support makes this bike a great value proposition. Some tradeoffs are to be expected however. The bike is a little heavier than the 2018 model at 73 lbs. Although there is some adjustability, it only comes in one frame size. Also the magnetic drag from the motor could become annoying if the battery ever dies on you. With all the options and configurations though, this bike will serve many uses and could even be used to replace your car. 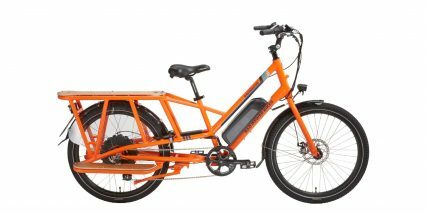 A big thanks to the Rad Power Bikes team for inviting me to look over the new RadWagon. If you have any thoughts, comments, stories, or information to share, make sure to check out the forums and sound off! You’ve got a couple references to the “DNP Flywheel.” I assume you mean freewheel. Yes, thanks for the heads up Craig ;) will get those fixed. 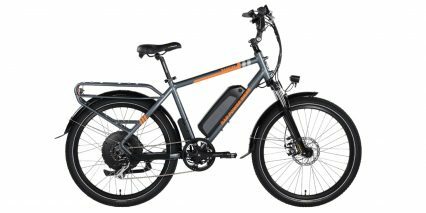 I’ve put about 50 glorious miles on my new 2019 RadWagon. I was apprehensive buying a bike online. I’m an architect/industrial designer, which is to say, I’m unusually picky and hard to please when it comes to product design. 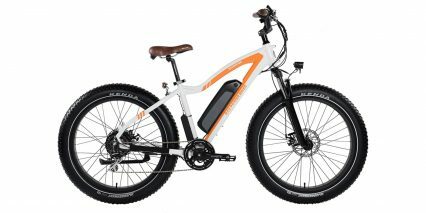 I was also a bit skeptical because similar electric bikes are much more expensive. The reason for my purchase is that I’ve just moved to the top of a significant hill, about a 3/4 mile long slog with 200′ vertical. As a daily bike commuter in all weather, I just couldn’t imagine making that climb on the cold/rainy/windy days we often get here in Blacksburg, VA. Anyway, I am blown away by just how good this bike is. I’m only about 145# but the bike makes the climb with little pedal assist in the top power level at about 8-10mph. And oh, that’s with my 60# son riding on the back. The two of us took the bike to the next town over on a very hilly paved rail trail on Saturday for about a 20 mile round trip. The bike is simply amazing. We only used about 50% of the battery on the trip. The bike is very responsive to pedal pressure and super smooth. It is well balanced, nice geometry – just awesome. And you seriously can’t even hear the motor. At 20mph the regen braking does kick in, which is a little annoying, but on the other hand, 20mph is fast enough. I’m 55 years old, and with age I’ve become more cautious in my definition of fun. I love riding bikes, always have, but more than ever I like to get there in one piece……20 mph is fast enough. The bike is super solid, shifts amazingly well. Sure you can buy better brakes but the brakes on the bike work just fine. I can’t imagine an unhappy buyer of this bike. 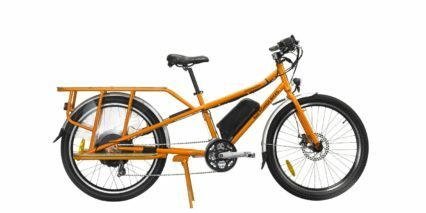 I’m already seriously considering a RadCity as a second bike for the family. Thanks a lot for the review. One sticking point for me before hitting the go button is size. I’m 6’4″ and I’ve always loved tall frames. I don’t mind an upright posture, but I do care about having my legs fully extend. Is the max seat height for this bike amenable to a tall guy like myself? Hmm, that’s a great question Charlie. 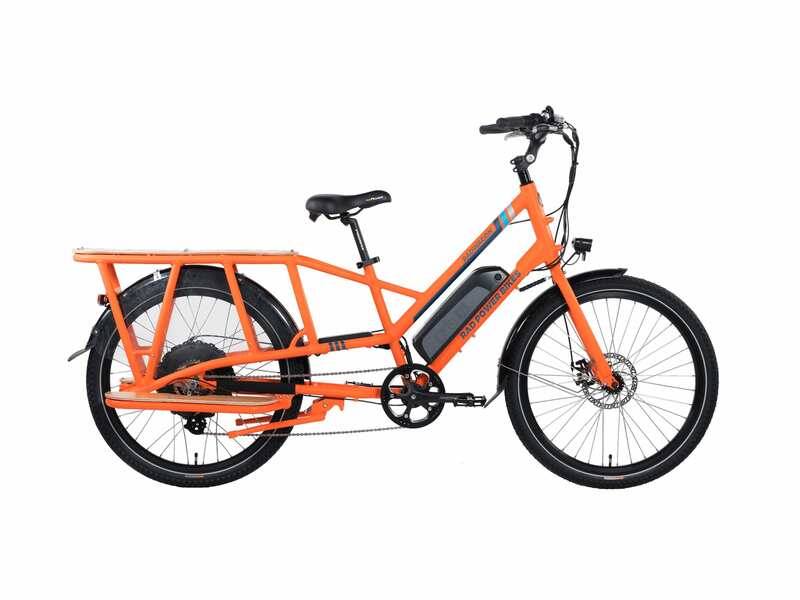 I think it might require a longer aftermarket seat post to get that full leg extension… The thing is, I’m not sure there are many alternative longtail cargo bikes that are any different, in terms of frame size. 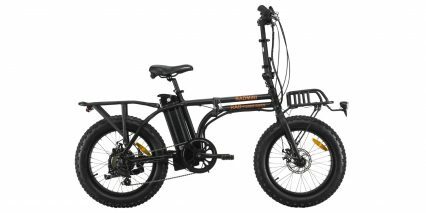 You could purchase a larger bike and then use an Extracycle attachment to extend the bike, but most purpose-built ebikes in this category only come in one size for now. 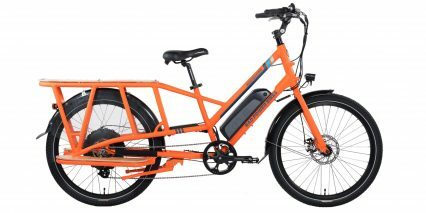 I’m wondering if a u-lock can be used including capture of the front wheel, without having to remove that wheel from the drop outs? There seems to be a lot of distance between frame and wheel rim. Great question, PJ. My guess is that it would not… especially with the battery mounted there. 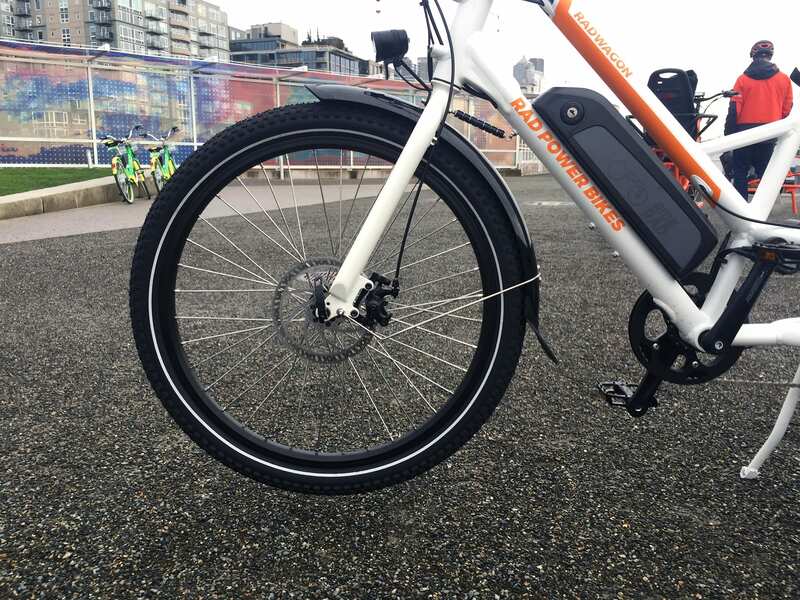 I think the wheel is positioned forward so there is space for the fender, and when you take an external pole or rack into consideration too, it’s just too far. You might need an extra long u-lock like this. 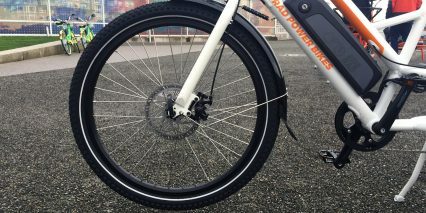 Another possibility is to use a short cable to loop the front wheel or even a second u-lock to secure the frame to the rack and use the first one to secure the wheel to the frame. I hope this helps! 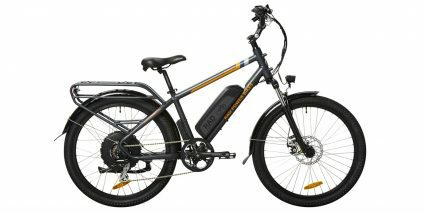 Hey Court, great to run into an old friend when I started looking for electric bike. I loved your reviews with great insights along with pros and cons before I even realized it was you. I’m glad to see you doing something you love so much. 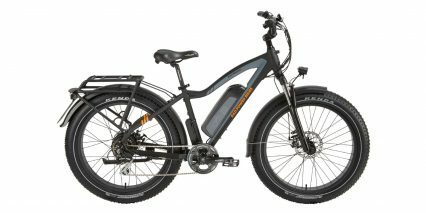 I am looking for an ebike that we can run around town and carry Wendy back up a decent 3/4 mile hill after happy hour downtown. We would be within the weight limit but I wonder if this one has enough power. I is a good pedal up on a normal bike but not strenuous. Hi, thanks for the comprehensive review. 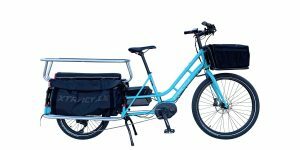 I am in the market for an electric cargo bike to commute and carry my two kids to school. 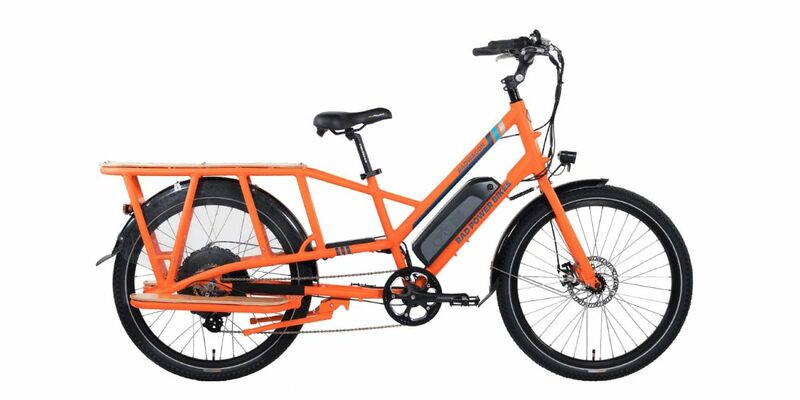 We’ve got some hills (500 ft elevation over 2 miles) and I wonder if my spouse will be able to handle them with the RadWagon as it has only one gear? Also, how can you explain the price point? 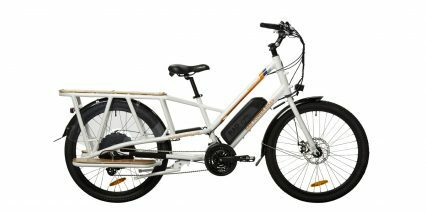 We were initially looking at the Tern and Yuba which are like 3 times the price. Just wanna make sure this is not a sacrifice on quality.